I find that, when Duff Man is out of town, I often revert to a vegetarian diet. It's not for any particularly noble reason--I'm just too lazy to thaw out meat when I can cook a perfectly delicious meatless meal as soon as I get home. Earlier this week, I took a look around my kitchen to figure out what I could make for dinner. I had pasta, broccoli, pumpkin, mushrooms and all the usual pantry staples. 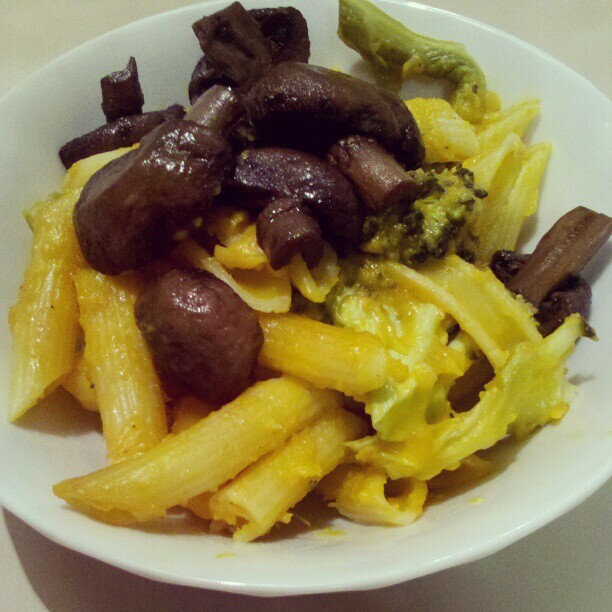 So I threw it all in a pot and made Pumpkin Macaroni & Cheese with Roasted Mushrooms and Broccoli. It was delicious and I had plenty of leftovers for lunch for the rest of the week. My friend Kate kindly pointed out that it's not actually macaroni. But really, just use whatever past you've got laying around. I will also note that I didn't actually measure anything so... well, your results may vary. I'm also doubling the recipe since I used 1/2 lb of pasta and that just seems silly to put into a recipe. Preheat the your oven to 425 degrees F. Toss the mushrooms & broccoli with a few tablespoons of oil--just enough to give them a light coating. Lay them in a single layer on a baking sheet (I lined mine with a silpat) and roast for 15 minutes, turning halfway. In the meantime, put on a large pot of water to boil for the pasta. Once the water has boiled, add a heft pinch of salt and then cook the pasta until al dente. Reserve 1 cup of pasta water before draining. In person, I'm not a really "touchy feel-y" person. Oh sure, I'm passionate and opinionated. But the big things, the emotions I need to sort out within my own head and heart, the important things--I don't let on how I'm processing those. Except in yoga. Yoga is where I learned to process those emotions, to acknowledge them and let them go. At my studio, we often joke about the "yoga mumbo jumbo," our affectionate term for the spiritual and emotional lessons we give and take through our practice. To me, a pose only feels truly authentic when I know why I'm practicing it. What is the lesson I should learn from the asana? As a teacher, when I approach class planning from this standpoint--by starting with why--I nearly always end up with a class I'm proud of. So in planning this week's class I turned to my emotions. And lately, I've felt conflicted. One of my dearest friends is, at this very moment, moving 2,000 miles away from here. I am thrilled--over the moon--for her and the opportunity she has for herself and her family. But I am also deeply saddened that I won't get to see her nearly as often. The two of us have talked (a little... she's not particularly touchy feel-y either) about that conflict--the excitement and apprehension of such a big move. So that's where I started planning my class this week. Excitement and apprehension. The need to feel secure balanced with the need to take a risk. I needed a balance pose where I could root into the earth but still engage my core and open my heart. Natarajasana, also known as "dancer," "king dancer," or "standing dancer," requires a strong connection to the earth, an engaged core, and an open heart. Finding a strong connection from my standing leg into the earth grants me security both physically and energetically. Engaging my core not only protects the low back and stabilizes the pose, but also enlivens the third chakra--responsible for my personal power and sense of self. While I feel less secure standing on one leg, a strong core allows me to safely open my heart through the physical backbend and to the emotional challenges provided by changes in life. I chose Natarajasana because it requires strength, flexibility, an open heart, and a little bit of grace. Natarajasana allows me--and my students--to find the inner strength to open our hearts and let them fly.